On Thursday, November 23rd, we invite you to visit Papagaj Restaurant & Lounge in Djenovici for a great evening with friends, followed by wine and guitar. 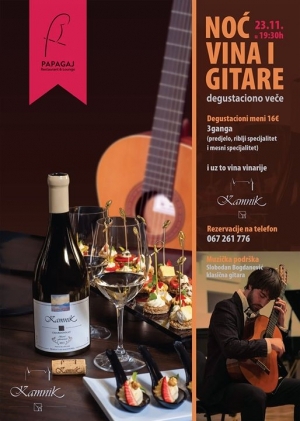 Wines will be by Kamnik from Macedonia and solo guitar will be performed by the young artist, guitar professor, Bobo Bogdanovic. Dinner will be made out of 3 gangs and the price per person is 16 €.